Many people suffer from pain. 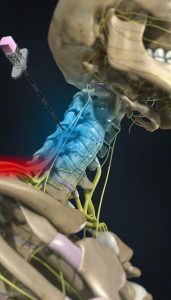 This pain may be in various locations, but for many it is in their neck. There are a number of procedures that can potentially offer relief. However, many people have tried some of the more common remedies and not had much success. Looking ahead at their next steps, surgery looms not far in the distance. Pain relief surgery can be a potentially dangerous and costly procedure, so many hope for a less invasive and more cost effective solution. Radiofrequency ablation offers a high success rate and long-term benefits. Radiofrequency ablation is especially beneficial for use in the cervical region of the spine for relieving pain. Put simply, radiofrequency ablation destroys the tissue that is sending a pain signal to the brain. It does this through the use of vibrating radio waves which create heat. This heat burns, or ablates, the nerve tissue that has been identified as causing pain. Radiofrequency ablation is a minimally invasive procedure that can be done on an outpatient basis. This procedure is done through the use of two small needles. These needles emit the previously mentioned radio frequencies. They are first carefully positioned by a doctor through the use of x-rays to pinpoint the exact nerve tissue causing pain. Once in place, the needles generate a small pulse of energy, transmitted as heat waves through the needles and into the tissue in question. This heat is monitored closely to maintain a consistent temperature for a few minutes. Once the tissue has been targeted and destroyed, the needles are removed. Although the procedure itself is brief, the effects can be long lasting and life changing. The procedure is done while the patient is awake, so that they can verbalize the exact location of pain and provide constant feedback to the doctor to ensure accuracy. Localized anesthetic is provided, of course, so the patient will not feel the procedure happening. Still, it is advised that clients not operate machinery for 24-48 hours to allow time for the anesthetic to work out of one’s system entirely. Radiofrequency ablation has been clinically proven to be highly effective, even for patients who have not seen results in alternative treatments. An additional benefit is that this procedure is only minimally invasive. Alternative treatments to radiofrequency ablation include use of potentially damaging steroids or other drugs or surgical procedures to remove pain. Compared to these possibilities, radiofrequency ablation is an effective and safe pain management technique. Radiofrequency ablation is shown to be clinically effective in the treatment of a variety of locations. The cervical medial branch is one key area that people report pain, and research has shown that ablation in this region has proven effective. In fact, according to some studies, up to 75% of those who have used radiofrequency ablation saw results from treatment quickly, with 66% reporting results lasting upwards of 2 years! Who Should Try Radiofrequency Ablation? Radiofrequency ablation is an effective and safe treatment for any number of sources of pain. There are very few reasons one couldn’t use radiofrequency ablation, such as if you have sites of active bleeding or open sores. Contact us today to schedule an appointment with Dr. Grimm to talk about radiofrequency ablation in managing your cervical medial branch pain, or any other source of pain. ← Could Electrical Stimulation Offer Pain Relief?